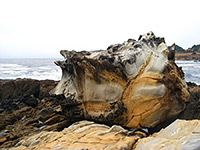 Like many other parks and preserves in Sonoma County along the north California coast, Salt Point State Park has sandy beaches, sheer cliffs, grassy bluffs and inland forests, but the best feature is the sandstone rock bordering the ocean, as this has been weathered by wind and water into many unusual forms and textures. The sandstone is found in contrasting shades of orange, grey and black, often in close proximity, and forms both large scale features - terraces, pinnacles, ridges, hoodoos - and a delicate honeycomb structure known as tafoni, where the surface erodes into numerous tiny intersecting cavities to create beautiful patterns in the rock. Some parts of the landscape are more reminiscent of the arid deserts of south Utah than the usually cold, foggy California coast. The state park extends for over 6 miles along the ocean front and includes a strip of bluffs and woods inland, either side of highway CA 1, in a little developed part of the state, far from any large towns. Besides hiking, camping and the usual beach-related activities, the area is a popular scuba diving destination, and the park also contains one of the first underwater reserves in the state. Fishing is allowed anywhere in the park apart from one small excluded area (Gerstle Cove). 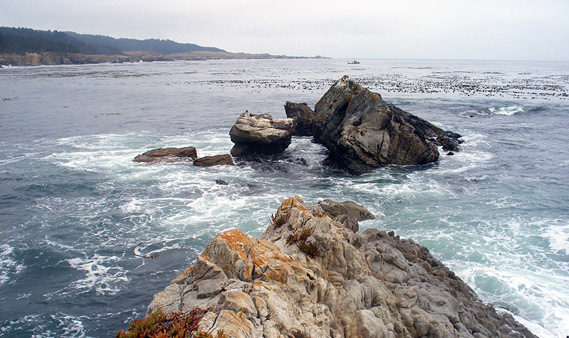 The main Salt Point State Park entrance is along CA 1, half way (18 miles) between Gualala and Jenner, and 95 miles north of San Francisco. Short roads lead to a campground and trailhead on the east side, and a visitor center, picnic area and second campsite on the west side. A day use fee of $8 (2019) per vehicle is charged for entry, though as is often the case with coastal parks, vehicles may be parked at various places alongside the road; there is no charge to enter on foot. 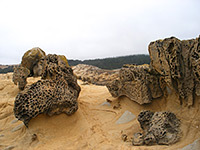 Most of the facilities are in the southern section of the park (see map) but the best tafoni rocks are in the north, reachable by a half mile walk from one of several laybys on the east side of the highway. The closest towns with hotels near Salt Point State Park are Cloverdale (52 miles), Healdsburg (50 miles), Santa Rosa (52 miles) and Windsor (47 miles). CA 1 is generally half a mile or more from the coast, and shielded from it by tall pine trees that persist a little way west but are replaced by open grassland near the ocean. 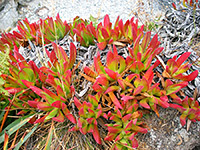 Several types of succulent grow on the salty rocks right beside the Pacific including the invasive ice plant (carpobrotus) whose leaves turn bright red in late summer. 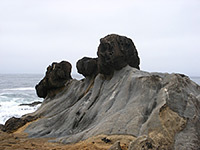 The shoreline is mostly rocky, with steep cliffs up to 50 feet tall, interrupted by coves containing sand or pebble beaches, some difficult to access owing to the sheer enclosing rocks. The sandstone (part of the German Rancho Formation) is composed of numerous thin strata, mostly fairly level hence the rock forms flat terraces, split by vertical cracks that erode into narrow channels. In some places fingers of rock extend some way out to sea, between deep, water-filled ravines. Low tide reveals many rock pools, filled with a rich and colorful array of marine life including sea stars, urchins, anemones, sea palms and kelp. The park is in general relatively little visited, once away from the central area, so the bluffs and beaches are quiet, unspoilt and litter-free. The surf is particularly strong much of the year, crashing against the jagged rocks with great force - see video. Salt Point State Park is centered on Gerstle Cove, a narrow inlet once used as a mooring point for ships here to transport quarried sandstone to San Francisco for construction projects in the mid 1800s. Trails run both ways along the shore, and connect the visitor center, picnic area and campground, this latter surrounded by Douglas fir trees and so shielded from the prevailing winds. 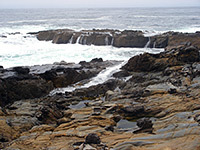 A portion of the adjacent ocean is designated the Gerstle Cove Marine Reserve in which all undersea life is protected, and divers here can explore kelp forests and associated wildlife, to depths of up to 30 feet. One mile north, the next official shoreline access is at Stump Beach - the largest stretch of sand in the park, this is reached by an easy trail from the parking/picnic area, running close to a small stream (Miller Creek) which flows into the ocean at the edge of the beach. Northernmost of the three main parking lots is at Fisk Mill Cove, another sandy inlet in a section of the coast with rather higher cliffs. A short path leads to a viewing area at the edge of a protruding part of the cliffs (Sentinel Rock), for fine views over the Pacific. Directly opposite the turn-off for the cove, a winding road leads through the Kruse Rhododendron State Reserve, a separate park featuring second-growth redwood trees and giant rhododendrons, which produce showy pink flowers in springtime. Most of the state park's 6,000 acres lies on the east side of Highway 1 - hilly, wooded land crossed by around 20 miles of hiking/horse riding trails. Top attraction hereabouts is the pygmy forest, a grove of dwarf cypress and fir trees whose stunted growth is caused by acidic soil and a hard rock layer just below the surface. A 3.8 mile loop trail crosses the forest, also passing through a patch of prairie and a mixed evergreen forest with rhododendrons. The larger of the two park campsites is located east of the highway; Woodside Campground has 79 clean and pleasant sites, open to vehicles up to 31 feet in length (no hook-ups).